Hi, We have a 5 year old hound, Gracey, our 1st dog, small & easy to groom, and her little kitty friend Sunny. My husband however loves poodles and he really wants a miniature over the next couple years. I want to know about grooming and hair cuts. We don't like the "poodle look" for our future puppy so I'm looking for grooming advice that's easy for me & comfortable for the dog and makes her look like a normal dog. I realize the poodle will also be somewhat smarter then my sweet little hound, (I really love hounds.) We want all our pets happy & well behaved, and Gracey is a very intelligent pup. I realize hounds aren't on top of the brainy list like poodles & herding dogs. Gracey & Sunny are very friendly toward other pets so I expect them to adjust well, but for our new baby poodle to also adjust - well I need to know how to keep her super dog brain happy. Gracey is much better now after 5 years of work but still has food aggression toward animals but it's no longer a problem with people because she knows who's boss. I give her problem solving toys with treats inside however I don't want my dogs fighting over these toys. Our dogs can only play with treat dispensing toys under adult supervision so how do I satisfy a young poodle without "food toys" when we can't be home? We live in an upstairs apartment so our pets also need outside supervision. All 3 pets must get along. Sunny is skittish he was traumatized as a kitten and came from irresponsible pet owners with too many cats and 1 NASTY litter box so he needs peaceful friends. Any advice or links for a multi-pet home with 1 really smart dog will be taken seriously. Thank you. 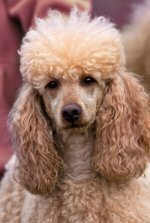 Take a look at our page on poodle clips for ideas on how to clip your future poodle. Usually a pet poodle is kept in a cut where the legs may or may not be shaved. Holly was kept with her legs trimmed but not shaved. Her tail was trimmed but not totally shaved. Her nose was shaved. It's an easy clip to take care of at home. Keep in mind a poodle will need to be brushed/combed frequently, especially the ears to prevent tangles. Poodles also need to be exercised daily. Take a look here for more information. It's important to socialize your poodle pup early to get him or her used to other animals and people. This page will give you more information on choosing a poodle and determining if a poodle pup is the right choice for your family. Join in and write your own page! It's easy to do. How? Simply click here to return to Poodle Forum.